Edinburgh, Scotland, 2017-Jun-21 — /Travel PR News/ — A 17th-century guest house with links to Bonnie Prince Charlie and Robert Burns has been awarded a Four Star Quality Assurance (QA) award from VisitScotland. 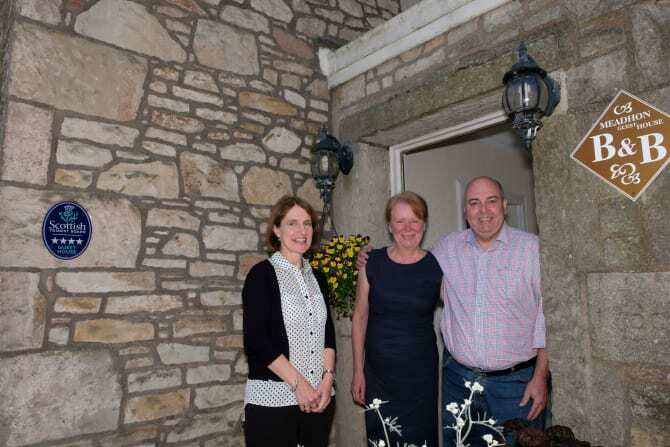 Meadhon Guest House in Jedburgh, the oldest house in the Castlegate area of the town, was upgraded to Four Stars following a recent assessment visit by a Quality Tourism Advisor, in recognition of the excellent quality of accommodation on offer. The guest house, which is famous for stabling Bonnie Prince Charlie’s horses on his ill-fated ride south in 1745, now offers a range of luxurious, ensuite rooms with stunning views of Jedburgh. The guest house has also been awarded Taste Our Best – a joint initiative between VisitScotland and the Scottish Government to recognise businesses including and promoting local Scottish produce on their menus. Paula Ward, VisitScotland Regional Director, said: “Congratulations to Meadhon Guest House on receiving this well-deserved award. The Guest House has a rich history and offers guests the unique opportunity to follow in the footsteps of two of Scotland’s most famous forefathers. This award is a welcome boost to the business as well as the region as a whole. This entry was posted in Business, Hospitality, Tourism, Travel, Travel Awards, Travel Management, Travelers and tagged Four Star Quality Assurance (QA) award, Meadhon Guest House, Paula Ward, VisitScotland. Bookmark the permalink.